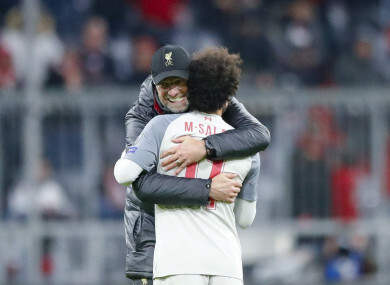 Salah is embraced by Jurgen Klopp after Liverpool's Champions League win over Bayern Munich. MO SALAH WASN’T going to make the same mistake twice. With Bayern Munich finally forced into commit to attack with 15 minutes left on the clock at the Allianz Arena, Liverpool’s latent threat on the counter attack was made blatant when the ball bounced obediently towards the penalty area along Salah’s scurrying feet. With Sadio Mane unmarked to his left he instead chose to weave into the cluster of Bayern players in the penalty area. Their swarming did the trick, and the ball trickled harmlessly to Neuer’s feet. Eight minutes later, Salah once again found himself darting in from the right-wing…but this time managed to chop the ball ahead of him with the outside of his foot; the ball carving an inch-perfect arc through the air and onto Mane’s forehead. Salah’s goals have dried up of late – he has just one in his last nine games, and four since the turn of the year – but he is far from out of form. Instead, having been carried to last year’s final by Salah the dead-eyed killer, Liverpool are on their way again thanks to his loading bullets into the chamber. Having continued to score goals in a different position at the start of the season, Salah has reverted to his more familiar right-sided berth in recent weeks, but with a different brief. In Munich he was the kind of outlet that Atletico Madrid could only dream of having against Juventus the night before, diminished as they were by having to make do with the timorous Alvaro Morata. With Liverpool’s midfield seemingly intent on presenting Bayern with the ball, their best hope of hanging onto the ball during their opponent’s fitful spurts of enthusiasm was to find Salah. His strength on the ball is remarkable: when Salah plants his feet, squats and thrusts his arm out, opponents can only grapple and jostle and claw at him helplessly. Salah’s defensive work was assiduous and thrillingly arrogant: in offering a nervy Alexander-Arnold abundant cover in the opening exchanges, he calmly exited a tight spot near the corner flag with a one-two garlanded with a back-heel and a mazy dribble. His evolution mirrors Liverpool’s, who have this season addressed the limits of their high-octane style of play. Klopp will forever be hunted by his ‘heavy-metal football’ remark, but as his Liverpool reign has progressed he has continued to tweak it, essentially finding solutions in which his players have to run slightly less. The fruits of that change has been seen in the Premier League thus far this season, and now it has shown itself in Europe, too. The hurly-burly of their play was perfect in stoking Anfield’s abundant energies last season, but it also led them to look flimsy away from home. They were fortunate not to be two down at half-time in the return leg against Manchester City, and conceded four times as they breathlessly fell over the line in Rome. Liverpool’s away form in the group stages this season was rotten – three defeats from three – but squeezed through thanks to some of those vibrant Anfield performances. An anemic performance in the first-leg against Bayern – particularly in the second-half – meant that, for the first time in the Champions League under Klopp, they couldn’t rely on their Anfield result and thus had to chase a goal away from home for the first time. Mane’s rich vein of form meant that they got the goal they needed, and while a rare lapse by Virgil van Djik and Andy Robertson led to a Bayern equaliser, they eventually clawed their way to a position of dominance by the hour mark. That they did so with a guileless, misfiring midfield owes much to the industry of Salah. Klopp tried to address his midfield issue by signing Nabil Fekir in the summer, but that ultimately didn’t happen. Xherdan Shaqiri provided a link between midfield and attack at the start of the season, but he has fallen out of favour in recent weeks, so Salah assumed that role in Munich. If he can continue to solve that problem in weeks to come, his lack of goals will cease to be an issue. Email “Don't be fooled by Salah's lack of goals - he is as important to Liverpool as ever”. Feedback on “Don't be fooled by Salah's lack of goals - he is as important to Liverpool as ever”.